John Ross Galbraith got the winning point for Ireland over Wales. Picture by Pat CashmanEngland successfully defended their Boys Home Internationals with a final day victory over challengers Scotland as Ireland - with Shane Lowry as cheerleader - secured third place with a convincing 10-5 victory over Wales at Baltray. England set out their stall with a 5-0 whitewash of their opponents in the morning foursomes. Scotland pushed hard in the singles but the high profile pairing of Toby Tree and Max Orrin put early points on the board for England. Scotland battled hard to halve the singles 5-5 but Derek Hughes’s side eventually won 10-5 to end the week undefeated. England claimed their 13th Boys Home Internationals title since 1996 when the competition changed to its current format. “It’s been a real team effort all week. The lads gave 110 per cent and you can’t ask for any more than that,” said a delighted Hughes before receiving The R&A Trophy. Tree got the better of Greig Marchbank 5&4 in the top match, while Orrin, who plays off plus four, defeated Craig Howie 3&2. It meant Orrin finished the week with a personal tally of 5.5 points out of 6, the same as team-mate Patrick Kelly, who halved with Jamie Savage in the third game. Tree secured 4.5/6 for the week. Scotland’s Bradley Neil showed great fighting spirit in the bottom match to come from behind to defeat Ashton Turner on the final green. Bradley was six-under for his round and the win ensured the Blairgowrie 16-year-old was Scotland’s top individual points scorer with 5/6. “Unfortunately England just outplayed us in the foursomes and that’s where we lost it. But at least we stuck in and halved the singles. That showed real character,” added Douglas. Ireland finished the week on a high with their 10-5 win over Wales. Roy Archibald’s side took a 3.5-1.5 lead into the singles where once again the Irish top order put some early points on the board. “We were front loaded with the likes of Gavin (Moynihan) and Alex (Gleeson), who produced some superb golf early on,” explained Archibald, whose top four players all won comprehensively with Gleeson five-under par after six holes. Irish Amateur Open champion Moynihan defeated Gareth Roberts, 7&5, Gleeson won 3&2 against Otto Mand, Robin Dawson won 7&6 against Gregory Tickell and Paul McBride beat Jack Davidson 6&5. Needing just another half point for victory, hosts Ireland never looked back and John Ross Galbraith’s two-hole win over Delon Hau in the sixth match sealed the win. “The good thing looking forward is we have eight of this Irish team available next year. The experience the boys gained this week is very important. Overall I’m very pleased with the way the week finished,” said Archibald. Wales captain Leighton Smith tipped his hat to Ireland’s dominance on the day. “Ireland were terrific. Obviously they came out fast and furious and gave us a bit of a thumping up front,” said Smith. “I think they also had a 12th man when Shane (Lowry) turned up to support them. England with their 100 per cent record for the week will defend their title at Forest Pines, Lincolnshire from August 6-8 next year. Scotland finished second, Ireland third and Wales were fourth in the standings. Ireland struggled as England and Scotland come out on top on day one at Boys Home Internationals in Wales. England won the Raymond Trophy - Ireland got the wooden spoon. Could it have been worse? The Home Internationals ended with a stirring Irish rearguard action on Friday but losing 12-3 to Scotland was still the end result. 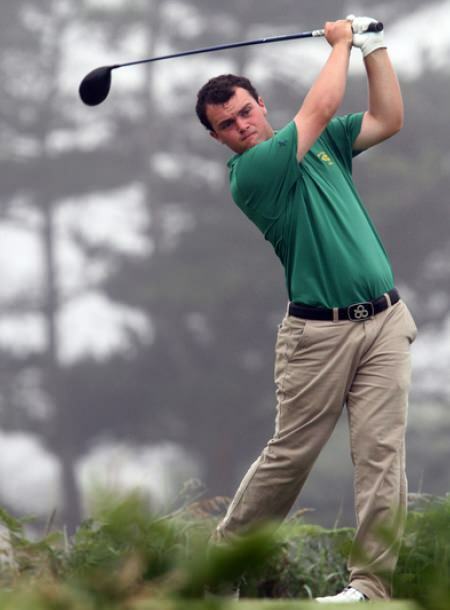 Ireland lost the foursomes 4-1 and seven of the ten singles with Dara Lernihan the only player to grab a win. Pat Murray and Connor Doran took halves but the Scots were simply too strong. 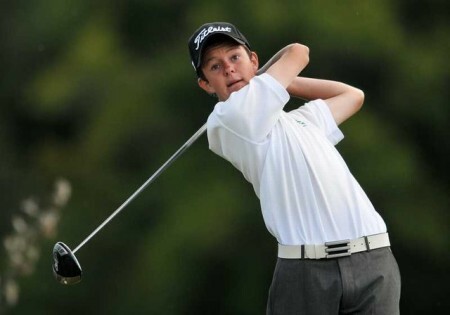 Jordan Hood, pictured during last year’s Boys’ Home Internationals, had a good first day. Picture Jenny Matthew/www.golffile.ieScotland and Ireland shared the spoils as England began the defence of their Boys Home Internationals title with a convincing 10.5-4.5 win over Wales at Forest Pines in Lincolnshire, writes the R&A. The victorious Irish Boys team with the Home Internationals trophy. 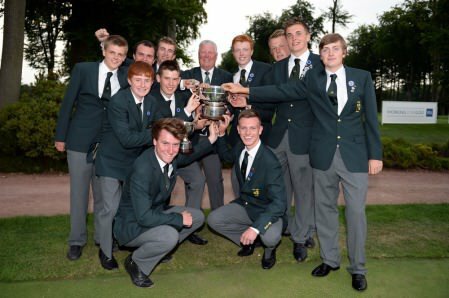 Ireland were crowned 2013 Boy Home Internationals champions after Roy Archibald’s side came through a dramatic afternoon at Forest Pines where they defeated Wales and Scotland were unable to overcome England in the final session of matches, writes the R&A. 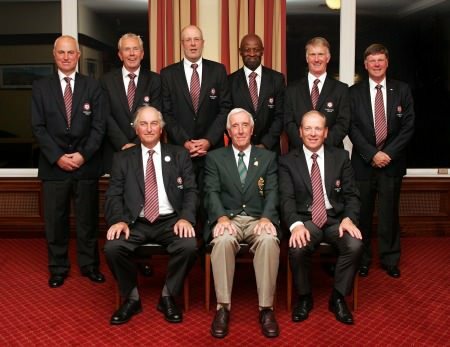 The winning England Seniors Home Internationals team at Royal County Down. Back Row, John Ambridge, Charles Banks, Andrew Stracey, Tyrone Carter, Richard Partridge, Chris Reynolds. Front Row, Richard Palmer (Team Captain), Ivor McCandless (President GUI), Richard Latham. Picture © David Ross/Ulster GolfEngland retained the Seniors Home Internationals thanks to a powerful 6-3 win over European champions Ireland at Royal Co Down.